Texas Teachers! 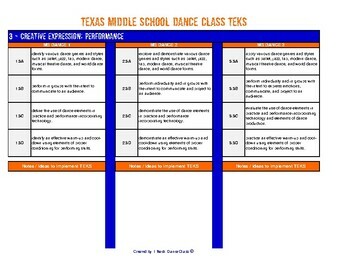 This is a clean and easily readable version of all of the middle school dance TEKS. This download includes middle school TEKS for dance 1, dance 2 and dance 3 in the same documents in a table format. I love this outline because it makes it easy to see the progression between all 3 levels for each TEKS. 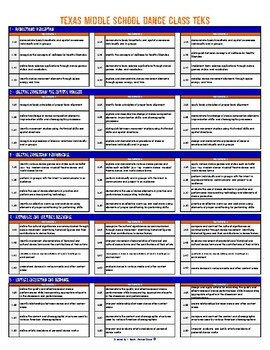 - If you are looking for daily scripted lesson plans. What format is each resource available in? All files are PDFs. In the event of a typo or error, please let me know and I will correct the PDF. Files are not editable. How do I download the new files? You can download your files in your TpT account under “My Purchases”. If you have any questions, please feel free to email me or use the Ask a Question feature in TpT. I want to provide quality products to help teachers and students alike, so please contact me before leaving feedback if you have a need. Products by I Teach Dance Class may be used by the purchaser for their classroom use only. This is a single classroom license only. All rights reserved. Resources may only be posted online if they are behind a password protected site.